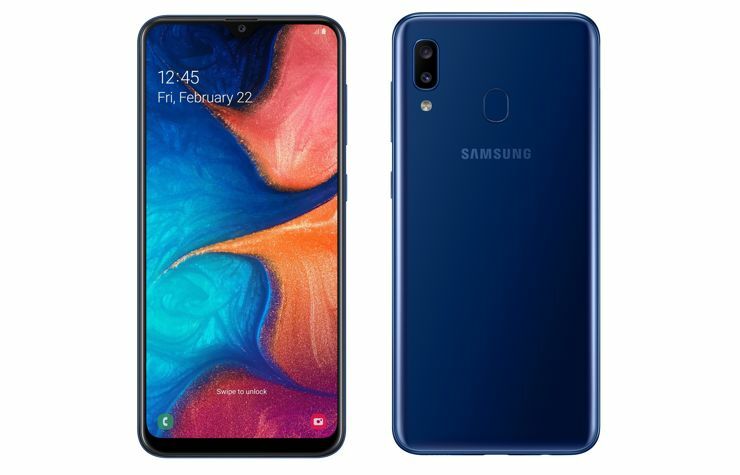 In addition to the already known models Galaxy A30 and A50, the Russian branch of Samsung has announced the launch of a more budget model from the series, Samsung Galaxy A20. Samsung Galaxy A20 was priced in Russia at 13990 rubles, that is, 218 dollars. What will we get for this amount? The advantage of the phone can be a 6.4-inch display. It has HD+ resolution, but it was made in Super AMOLED technology. A big advantage can also be a 4000 mAh battery. There are also decent cameras – as for such a price of the phone. The front has 8 megapixels and the F/2.0 lens, while the back is dual, with 13 and 5 megapixels and F/1.9 and F/2.2 lenses. Unfortunately, Galaxy A20 uses the same budget processor as the cheapest model from the A family, Galaxy A10. Exynos 7884 juxtaposed with 3 GB of RAM and the Android Pie with the One UI interface will not provide rather rousing performance, but as a consolation there will be tolerable 32 GB internal memory with a slot for microSD. The phone also has a fingerprint scanner, and everything has been enclosed in a 3D-styled housing, which is 158.4 x 74.7 x 7.8 mm. Source Samsung; viewed: 294 times.